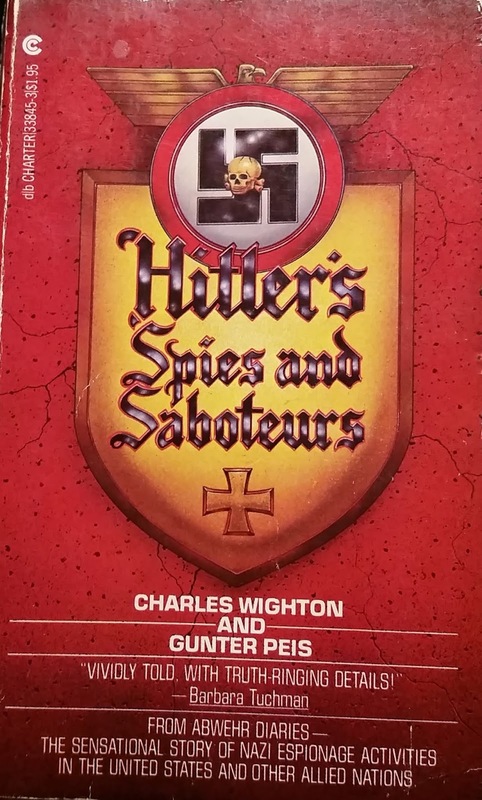 Hitler's Spies and Saboteurs. Charles Wighton and Gunter Peis. Charter Books. 1958. I may have read this book years ago but given Bernard O'Connor's reliance on it (see the previous post which reviews O'Connor's book - Operation Lena - Hitler's Plans to Blow up Britain), I thought I would read it again and give a quick review. This book's primary claim to fame is that it is ostensibly based on the wartime diaries of Erwin von Lahousen, former chief of the German Abwehr's sabotage section (Abteilung II) and Admiral Canaris' right-hand man. A few caveats are in order. The book was published in 1958, thirteen years before Masterman's account of the British double cross system. The book is therefore quite one-sided and lacks balance. In fact, any wartime espionage book published prior to the declassification of the British Security Service files (starting in 1999/2000) will be hamstrung to a certain extent by the absence of reliable information. "In the intervening period [after the Nuremberg war trials] until his death in 1955, Lahousen gradually revealed the full stories behind the entries in his diary to a young, fellow Austrian, Gunter Peis, whom he had first met in Nürnberg. Lahousen also revealed the names and postwar whereabouts of some of his Abwehr subordinates; as an Abwehr executive he had rarely known more than the broad outlines of the main operations. The authors have offered us a fairly important qualification. The book is not based solely, nor even primarily on Lahousen's diaries, it is based on the recollections of former Abwehr officers and agents. That puts a completely different spin on the book. We already know that names will be altered and possibly even the circumstances surrounding the stories. At the very least, the book is based on the fallible memories of individuals fifteen years removed from the events outlined in the book. Individuals who may also have fudged the truth a bit in order to protect reputations or lives. The book is divided into nine chapters and it is possible to tentatively identify some of the individuals who likely related their stories to Wighton and Peis. This is made somewhat more secure by comparison with Major Nikolaus Ritter's memoir (Deckname Dr. Rantzau) published in 1972. Several of the Wighton and Peis chapters bear a strong resemblance to Ritter's recollections. Chapter 1 - Spies in America! - This chapter tells the story of a German spy ring in America (1941) and of how the Germans acquired the Norden bombsight from the Americans. The account references a Major Ranken from the Hamburg Abwehr office. We know that this was a code name for Major Nikolaus Ritter, the German spymaster who received the Norden bombsight from his spies in America. Ritter and/or Hermann Lang would seem to be the most likely sources for this particular chapter. Chapter 2 - The Nazis "Invade" America - This chapter tells the tale of Operation Pastorius (1942), an attempt by the Germans to land eight saboteurs at two locations along the American coast. One of the agents betrayed the operation to the Americans after landing. All eight were prosecuted, found guilty and sentenced to death. The sentences of two of the men, Burger and Dasch (the agent who betrayed the operation) were commuted to imprisonment (life and 30 years). In 1948, Burger and Dasch were deported to Germany where they were viewed as traitors. Given some of the information provided within the chapter, Dasch seems likes the most likely source. "When in 1953 he wrote to Germany, he said he was happy to know that there were still people in the Fatherland interested in the men who had 'served and remained true to the idea'. And after the usual German greetings he ended his letter with the words 'Heil Hitler'." (Hitler's Spies & Saboteurs, p. 119-120). It would seem that Leibbrandt was one of the primary sources for this chapter. Another possible source is Christian Nissen, the skipper of the yacht who delivered Leibbrandt from Europe to Africa. Chapter 4 - First German Parachutists in England - This chapter relates the very garbled tale of Wulf Schmidt and Gösta Caroli (1940), although Wighton and Peis give the two spies different names. They reference Dr. RANTZAU, the alias of Major Nikolaus Ritter of the Hamburg Abwehr. As with Chapter 1, Ritter is the most likely source for this chapter, particularly as much of the account dealing with the arrival of the two agents in England was related to Ritter in Lisbon by agent JOHNNY (the German code name for Arthur G. Owen, double agent SNOW to the British). Chapter 5 - "Johnny," the Welsh Master Spy - This chapter tells the tale of Arthur G. Owens and how he became involved with the German Abwehr (1940 and 1941). Again, Nikolaus Ritter is the most likely source for this chapter. Chapter 6 - Vera, the Beautiful Spy - This chapter tells the story of Vera Eriksen, Karl Drücke and Werner Walti (an alias) and their ill-fated espionage mission to Great Britain (1940). We learn how Vera's lover, Abwehr officer Dierks was killed in a car accident. The account mentions a "Captain Graaf" from the Hamburg office, the identity of whom is uncertain. It could be Ritter, Wichmann, Praetorius or even Boeckel. Towards the end of the chapter, the authors relate how, whilst held at Bad Nenndorf after the war, the Abwehr officers learned that Vera was living on the Isle of Wight under an assumed name. We know that all four officers (and even Lahousen) passed through Bad Nenndorf. After the death of Dierks in the fall of 1940, the three spies were sent to Norway for their mission to Great Britain and, from later chapters, it would seem that Wighton and Peis had access to some of the Abwehr officers who served in Norway (see Chapter 8 notes below). Finally, the authors may have talked to some of the Scottish officials involved in the capture of the three agents: Edinburgh Police Superintendent Merrilees, Port Gordon's Police Constable Grieve and Buckie's Inspector John Simpson. The authors knew the current (1950s) career status and location of Merrilees and Grieve and relate a verbatim account of the capture from Inspector Simpson. Chapter 7 - They Wanted to Join the British Army - This chapter is a bit of an anomaly as it tells the story of five German agents who were sent to Great Britain (1942) with the cover story that they were defecting German soldiers. They were taken to London where it would appear that they were interrogated at the London Cage under Lt. Col. A.P. Scotland. The account of their incarceration and interrogation sounds more like the London Cage than Camp 020. Four of the agents were sent back to Germany at the end of the war while the other one, a Brazilian-German was sent back to Brazil. The primary source seems to be one of the agents, Hans Braun, who related some of the story "fifteen years later with great glee". Elsewhere, the authors quote Braun as he was sitting in a Hamburg wine house fifteen years later (p. 240). Apparently "even today he sometimes wakes up in a cold sweat after dreaming that he is under interrogation". Other sources might be the Abwehr officers who served in Norway (see notes on Chapter 8 below). Chapter 8 - The Norwegian "Refugees" - Here we learn about John Moe and Tor Glad (both given different names by the authors), two Norwegians who landed on the coast of Scotland (1941) and their subsequent sabotage exploits. The most likely sources would appear to be some of the Norwegian Abwehr officers: Mueller (took command of the Abwehr post in Oslo at Klingenberg-gate), Anderson and Koblischke. All three are mentioned in some of the earlier chapters. "Lahousen, too, was beaten and kicked and had some of his teeth knocked out by ruffians, military jailbirds whom the British command saw fit to employ as warders in the camp." (Hitler's Spies & Saboteurs, p. 282-283). But, the authors also note that the "British secret-service officers in the camp... had no part in the brutality". A few years later, Robin W.G. Stephens, commandant of Bad Nenndorf and former commandant of Camp 020, would be tried by court-martial because of the brutal treatment meted out to prisoners at Bad Nenndorf. He would be acquitted. This last chapter, has several references to Lahousen's diary but does not provide any supplementary information suggesting that the authors didn't have other sources to provide a juicy narrative. This is actually an entertaining book but it is out-of-date and wildly inaccurate. Reading it is kind of like looking at the world through a really thick pane of glass which distorts reality. Readers are advised to track down more reliable sources if they are interested in any of the stories. During this period [ZIGZAG/FRITZCHEN'S time] one of the few Germans sent to England, a Captain Huebner, also operated successfully. I've never heard of a Captain Huebner successfully operating in England and Wighton & Peis provide no further information. It's clear that one can't make much of this information without tracking down some primary sources. As for the book being based on Lahousen's diaries... that remains a matter for discussion. Readers are advised to consult a recently published book by German author Michael Mueller: Canaris: The Life and Death of Hitler's Spymaster (2017). Mueller's research is based on German sources including, apparently, Lahousen's diaries which are held in the military archives in Freiburg. For that reason alone, Mueller's book is on my "to-read" list. 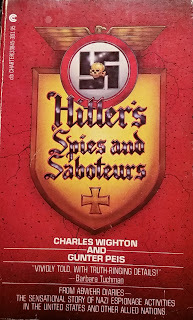 3 out of 5 - Hitler's Spies & Saboteurs is an entertaining "popular" history read, as long as one is not looking for an accurate, up-to-date historical account. It would be better categorized as fictional-history.